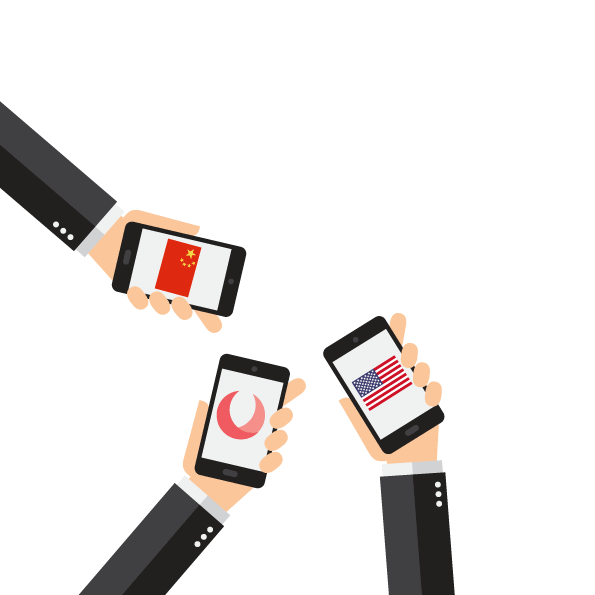 Chinese estimated m-commerce activity for 2015 accounts for nearly 450% more than that of the U.S. Here in the States, it has been forecasted that m-commerce sales will go up 32%, putting U.S. m-commerce at 22% of total retail eCommerce.2 In the U.S., this accounts for 1.6% of all retail revenue. The same mobile usage stats for China represent nearly 8% of all retail sales in that country. China has about 520 million online shoppers as of 2015, with the U.S. checking in at around 200 million. According to forecasts done by research firm Digi-Capital, tech-savvy China will do an astonishing $230 billion in mobile commerce in 2017.3 (Some estimate as high as $500 billion.) In the U.S., m-commerce will also increase to about $144 billion. With the meteoric rise of m-commerce, you can expect to see some serious shopping options for your mobile device. Along with the impressive amount of purchases and app downloads made via mobile, one of the primary uses of mobile apps in China is social media, according to Innovation Is Everywhere. China’s social media population comes to 668 million, which is more than the U.S. and Europe’s put together. So what have Americans been downloading? Apparently we also love making social connections. According to qz.com, the top three downloaded apps are for social media. Collectively, Facebook, Youtube and Facebook Messenger received approximately 323 million downloads in the first half of 2015.5 And I’m happy to report, of the top 25 apps downloaded, not one was a game! Clearly, mobile usage stats point to a growing mobile-first retail world. When people start reaching for their cell phones rather than heading to their computers for things like shopping or social media, you don’t need to look for any more evidence than that. For more on the mobile-first economy, see “BRIC AND THE MOBILE FIRST ECONOMY” in this blog. Regardless of where in the world you happen to be, mobile shopping or not, you’re going to need to communicate; and what better way is there than to communicate for Free? With Voxox, you get unlimited free calling and texting in-network! Out of network and international calls are super cheap. Download is free and setup is easy. Talk and text for free with Voxox and get the most from your mobile phone. Mobile Accounts for Almost Half of China's Retail Ecommerce Sales, emarketer.com.